If you would like to see a spectacular high school graduation ceremony in Ternopil, you better visit this city in the second part of June. 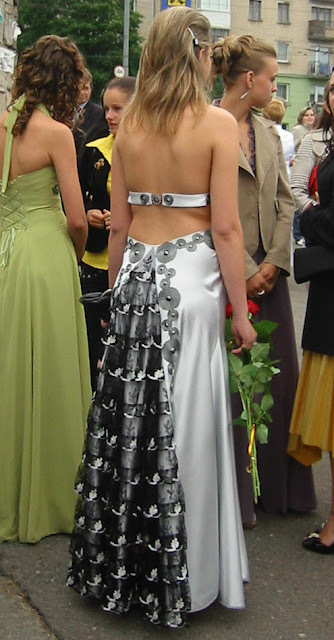 Actually, it was the way, how my family planned our trip to Ukraine in 2009: to be there for graduation day (in 2009 it was June 20) and to see the high school graduation celebration which is very unique there. 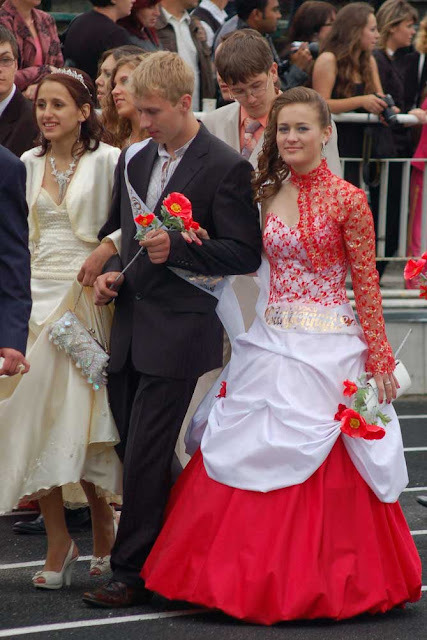 Ternopil is only city in Ukraine which has a magnificent parade of high schools graduates and their teachers; also Ternopil is only city which has a cash prizes contest for graduates for the best prom ball costume in Ukrainian style. So, June 20, 2009 it was Saturday and Saturday it is usually wedding day in Ukraine. But! If somebody would plan to have a wedding party this day (birthday, anniversary party or other celebration), he would have a big problem to find a restaurant in Ternopil for June 20, because almost all the restaurants were booked a year or even two years before (!) for high school graduation parties. As Ternopil has 30 high schools, so, as we saw, almost all the places were busy that day. Actually, high school graduation parties begin at night, after 7 p.m. But graduates have different ceremonies all day long. At noon of the graduation day the graduates usually say “Good-bye” to their high schools by visiting the schools and having small concerts and speeches there and (the main part!) getting their high school diplomas. At 4 p.m. graduates and their teachers from all the Ternopil schools get together by the Ternopil Lake. They get ready for the parade from the Lake to the city’s stadium for the official high school graduation ceremony. 5 p.m. traffic is stopped on the central street of Ternopil and the grandioso parade begun! Traditionally the high school graduation parade in Ternopil is accompanying by some unusual cars: in 2008 there were cars from the tuning-club of Ternopil; in 2009 the Ternopil “Retro-Cortège” club gave a few classic cars for the parade opening. The wind band and the representatives of the Ternopil regional and city’s authorities were walking after the classic cars; finally, all the high school graduates, their teachers and parents were following the authorities (take a look at the pictures and videos below). Well, now you can see that high school graduation in Ternopil it is a big celebration not for graduates, their teachers and parents only, but for whole city as well. People go to see the graduates’ parade in Ternopil like the Santa-Claus parade in North America or carnival in Rio. Or this one, bride-like dress. This white outfit, though, can look as a “bride-like” for western people only. 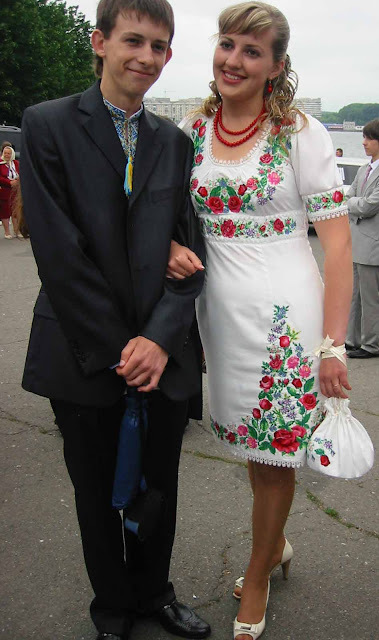 To wear white for a graduation party it is absolutely normal in Ukraine. Well, take a look at this girl again, how stunning and beautiful she is, never mind a color of the dress! I asked these girls where their gorgeous outfits from, expecting to hear they are from some fashion designers, but the graduates has answered me, that this costume made by mother, that one by sister, another one by aunt etc. Wow, what a talented women in Ukraine! Gucci and Galliano, come to Ternopil for inspiration :)! For me, I got inspired not just by women’s clothes on this parade, by for men’s as well. Look at the picture of this guy! Actually, he is a girls-dream type: handsome, well-dressed and well-mannered, everything is matched so well, that, oh my, too bad, I am not 17 years old girl anymore :) ! So, I can just enjoy watching his modern black shirt with floral embroidery. 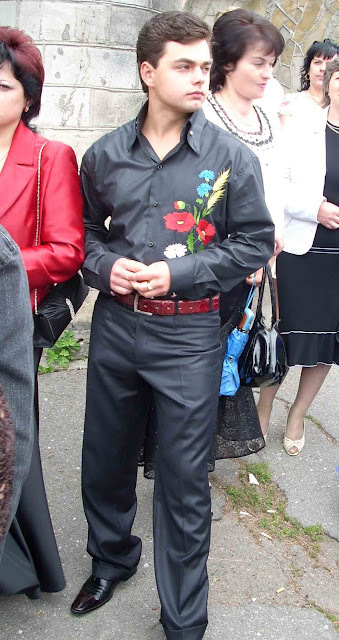 The flowers on his shirt are typical Ukrainian: cornflowers, poppies and camomiles. Oh, here he goes again, walking with his school OK, enough staring at boys :), I continue my story about the high school graduation ceremony in Ternopil. The participants of the parade finally got to the city’s stadium where the representatives of the local authority congratulate the graduates for the finishing high school and award the best of them with “golden” and “silver” medals. The medals (not literally golden and silver though :) are given for graduates which got the best marks in their high school diplomas. The total number of Ternopil’s graduates-2009 is 2204; 164 of them got the “golden” and “silver” medals. After the official ceremony the graduates, their parents and teachers finally can relax: they are heading to the restaurants for the graduation parties. Usually graduates are partying whole night and they go to the lake at the early morning: to see the first “big” sunrise in their life (such a tradition in Ukraine). Subscribe to Travel Ternopil by Email! It's simply! Square and Pigeons… Rome? Venice? Nope, Ternopil, West Ukraine! Roksolana Bogutska's Boutique: Now In Ternopil! © 2006-2018 Travel Ternopil. Simple theme. Powered by Blogger.